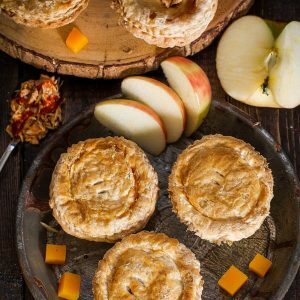 Mini puff pastry dough pot pies filled with roasted butternut squash, sweet apple chunks and tender slow cooker pulled pork infused with the sweet and spicy combo of maple syrup, sriracha and hoisin sauce. Surprise! Today is a special day! 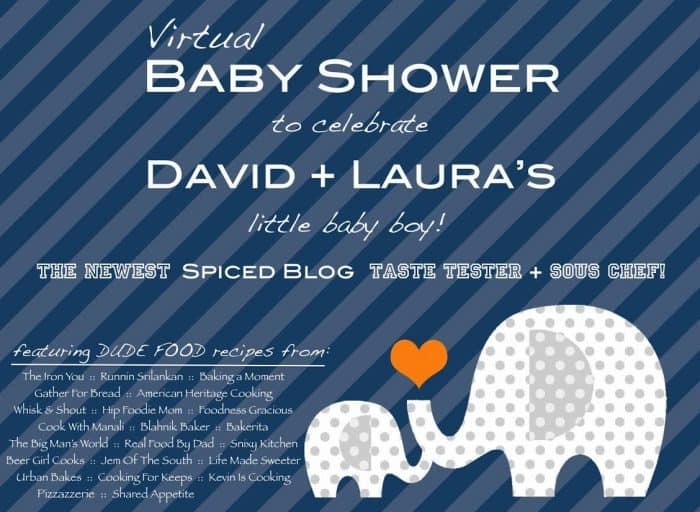 We’re finally taking a break from all things pumpkin today and celebrating David from Spiced Blog, with a virtual baby shower! David and his wife Laura are expecting their first bundle of joy in just a few weeks — a sweet baby boy and a few of us bloggers have gathered together to throw him a party! Having two small kiddos myself, I couldn’t be more excited to be a part of this. For those of you that know David, he loves grilling and Southern food so we each brought along something to share that fits this theme. 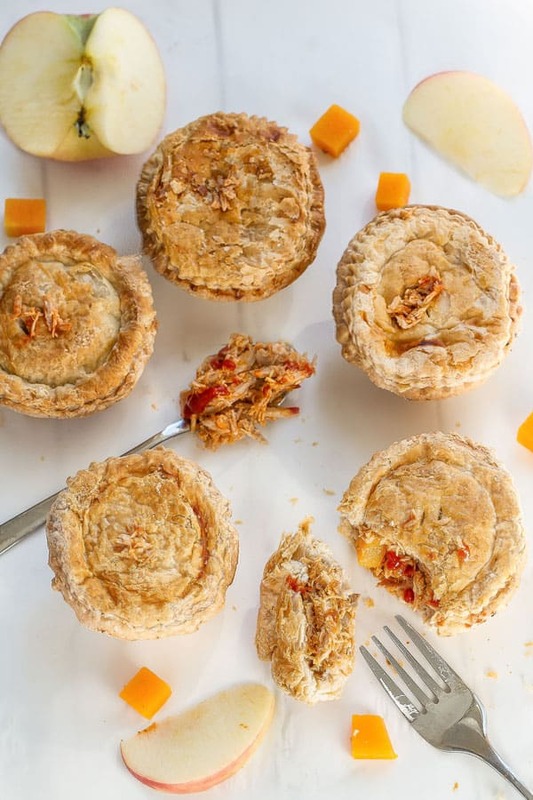 To create these Maple Sriracha Pulled Pork Mini Pot Pies, I channeled my inner dude food taste buds (aka ask the husband 🙂 ) and pulled together an easier version of pulled pork made in the slow cooker. Because like any parent with little ones will soon realize — a meal that you can just throw together and forget about until it’s ready to eat is a winning battle to be celebrated! 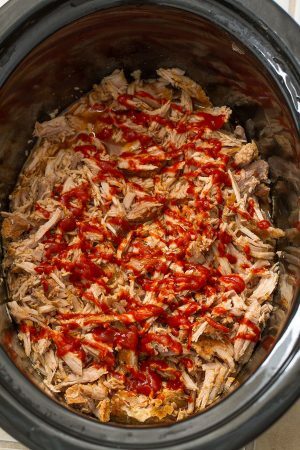 This pulled pork cooks up nice and tender after eight hours of simmering away in the crock-pot with some garlic, onions, maple syrup, Sriracha, soy sauce and hoisin sauce. 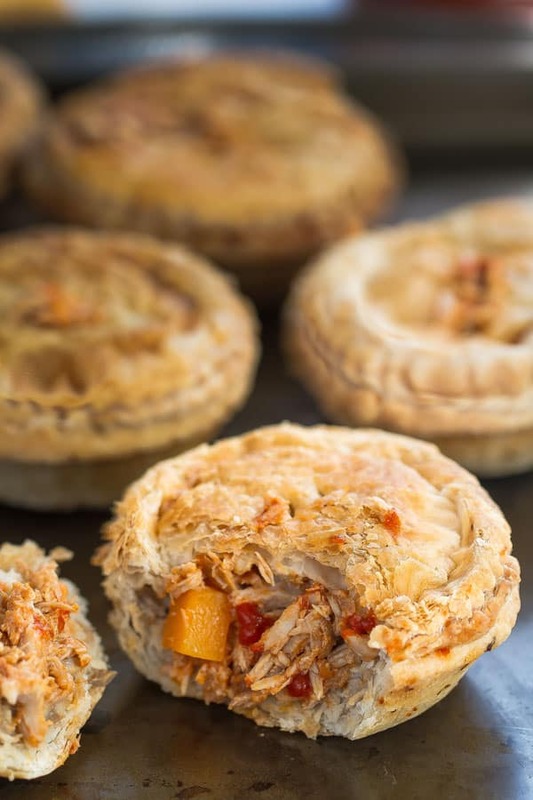 The flavors are seriously mouth watering on its own but since this is a baby shower I decided we could use some finger food so I tossed the pork together with some roasted butternut squash, chunks of sweet apple and stuffed them all together into mini pot pies. To keep things on the easier side, we used a package of thawed frozen puff pastry and baked them up in a muffin tray. These mini pot pies have a Southern Asian fusion vibe going on plus they’re cute and manly at the same time making them totally appropriate for a dude shower. Don’t forget to stop by David’s blog to drool over his wonderful creations and and wish him “Congratulations” and be sure to check out all the other delicious recipes the rest of the awesome bloggers brought! A big thanks goes out to Chris of Shared Appetite (a new dad himself) for organizing this shower! Congratulations David and Laura! Welcome to the world of parenthood, we are so happy and excited for you! 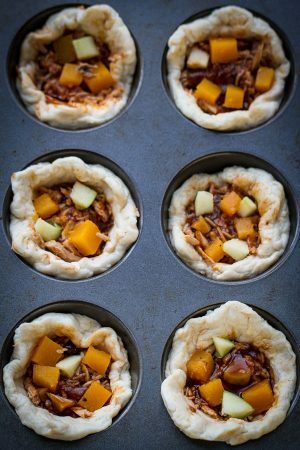 Mini puff pastry dough pot pies filled with roasted butternut squash, sweet apple chunks, and tender slow cooker pulled pork infused with the sweet and spicy combo of maple syrup, sriracha and hoisin sauce. Trim pork shoulder of all excess fat. Coat with olive oil and season with kosher salt and pepper. Place pork in the bottom of the slow cooker. Add 1 teaspoon of olive oil and saute garlic and onions for about 3 minutes. 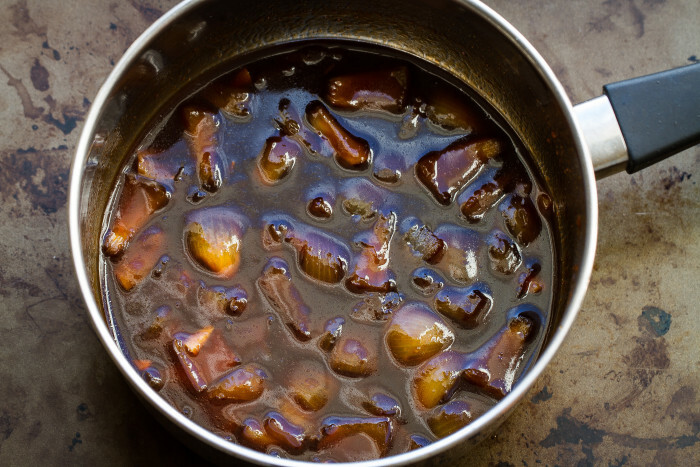 Reduce heat to medium-low and add the maple syrup, Sriracha, hoisin, soy sauce, tomato paste, apple cider vinegar, orange juice & brown sugar and cook for about 5 minutes. Spoon sauce over all sides over the pork. Cover and cook on low for approximately 8 hours (or high for 4 to 5 hours), until fork tender. Shred pork with two forks. Continue to let cook for about 30 more minutes to absorb juices. Discard garlic cloves and onion before serving pork. Spray muffin tray with nonstick cooking spray. Divide puff pastry square into muffin tins. Keep remaining pastry covered and chilled. Spoon about 1/4 cup pork mixture into each biscuit cup. Top with a few pieces of butternut squash & apple chunks. Drizzle with another 1 tablespoon of sauce over filling. Top with another puff pastry square and pinch the sides of the pastry together. Cut two slits at the top of the pies and brush with egg wash. Place entire muffin tray in the fridge for at least an hour or overnight. Bake for 17-20 minutes or until the pastry is golden brown. Let the pot pies cool in the pan on a wire rack for 5 minutes. Refrigerate any leftover pulled pork and use within 3 to 4 days. Don’t forget to check out the other fabulous recipes for David’s baby shower! Maple and sriracha? yes please! I am starting to collect ideas for party food for Dave’s 40th birthday and these will be perfect. Great man food! What a fun recipe, Kelly! These sound like the perfect dish for a baby shower. I love all foods in mini form too, so I’m sure these wouldn’t last long in my house. Such a creative recipe! Kelly – your pot pies sound fantastic! And I simply adore the way they look! Cannot get over how flaky that crust looks like! Simply fantastic! What a fantastic flavor combo!!! A little spicy, a little sweet, a little salty! Girl you are killing it!!! You’ve somehow managed to use all of my favourite words in one amazing recipe title. Seriously, these sound (and look!) so good!! These sound SO flavorful and so incredible – I love pulled pork!! All wrapped in flaky puff pastry too? Sounds fantastic. Aww, how fun! Congrats to them! This is such a great idea, and it looks amazing! Maple and sriracha sounds incredibly awesome. And these Mini puff pastry dough pot pies sound so good. With the filling of roasted butternut squash, apple chunks. Looks perfect for baby shower. These pot pies are definitely dude food! Even as a lady, I want to devour one. Great job! What a great combination of flavors! My husband would love these! Maple sriracha is just such a good combo and I LOVE that you combined it with pork and pot pie!! This sounds awesome Kelly!! One of my favorite things to eat as a kid were pot pies…and I’m certain they were not homemade, so you can imagine my thrill over these! Gorgeous and delicious! pies are my absolute favourite comfort food! These pulled pork mini pies sound so delicious Kelly! Love the sriracha flavours too! I just went through that entire ingredient list and there is not ONE thing that I don’t love Kelly! These are the ultimate pot pies! What chicken pot pies, I never want one after I saw these. OMG they look so good, that butter dough, the pulled pork, all favorites of mine, amazing recipe. Pinned. Great flavors! These pies look beautiful and delicious! Love the photos Kelly! Congrats David and Laura! These look amazing! That delicious flaky crust! I desperately need this in my life, Kelly. These mini pot pies look utterly delicious! Holy smokes!!! I love everything about this! Total comfort food! 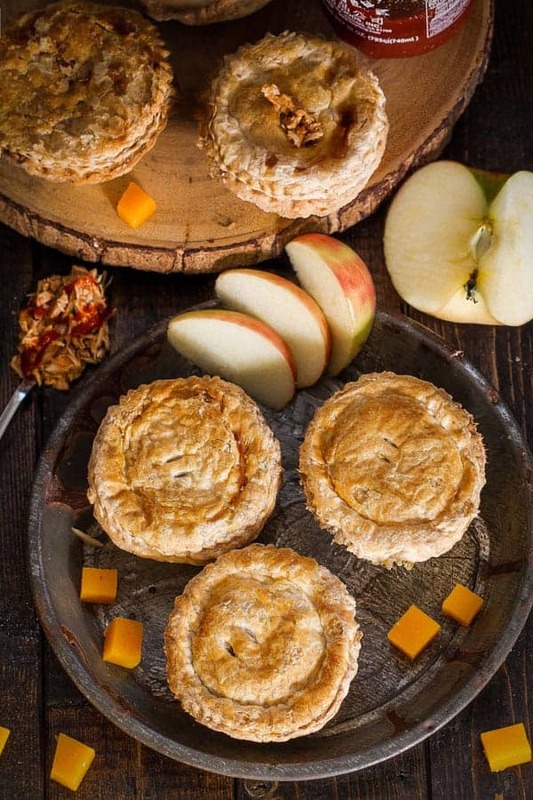 Those pot pies are just adorable and those flavours sound incredible! I definitely need to make those soon!